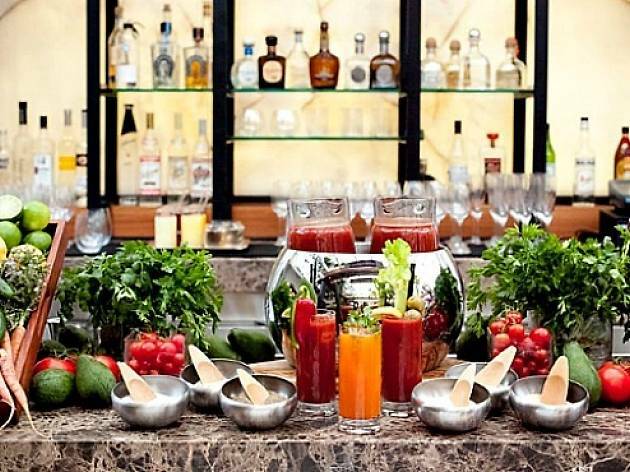 Photograph: Courtesy Dorchester Collection Hotel Bel-Air Bloody Mary Bar. Spoil Mom this Mother's Day with a fine dining brunch courtesy of Wolfgang Puck. Head to his Hotel Bel-Air outpost and enjoy a three course pris-fixe brunch while looking out on the lovely Swan Lake. Choose from favorites like Old Fashioned Ricotta Lemon Blintzes, Maryland Blue Crab Cakes and more. Cost includes an after-brunch dessert station and a choice of Champagne, Mimosa or a Bloody Mary.